Masolino, thanks, I shall consider Suzukis second set. The situation may be the same as to Sigiswald Kuijkens recordings of the solo Sonatas and Suites for violin, as I own the first recording and am a bit hesitant as to the aquisition of his second recording. Even more as I own about 25 sets of the violin solo music already. Two sound examples from Suzuki II for your consideration - yvgapm. I not only like Sigiswald Kuijken's violin S&P's, but I like Wieland Kuijken's cello suites even more! Suzuki's Bach is quite a different animal from the Kuijken (Arcana) but I find owning both to be a real pleasure, beautifully recorded as they both are. Yes Wieland Kuijkens cello suites are perhaps the most introspective ever recorded, and still within the frame of a true baroque concept. I like them very much too. They are like nothing else. But my question was, if you in a similar way think, that Sigiswald Kuijkens second set is a must-have, seen in the light of the fact that I already own his first set. sounds great but where can I find it? Checked amazon.com and hmv jp and didn't see it listed. Thanks again, Masolino, seems as If it is a must-have. I've already got more recordings of the cello suites than anything else but it looks like there are a bunch more good ones that I don't have! So far my favourites are the ones by Casals, Tortelier (student of Casals), Markson (student of Tortelier) & Fournier. There are many fine recordings. I think Heinrich Schiff's stands out as one that takes the notion that this is stylized dance music seriously. His recordings have a rhythmic drive that all other recordings I have heard lack. The 1957 recordings were issued by EMI in France in a boxed set at a ridiculous (cheap) price, coupled with the Johanna Marzty violin sonatas and partitas. I have this set and enjoy it (the Martzy Bach is a treasure IMO). However, IIRC, Starker did the Bach suites at least three times, maybe more. The EMI are good but the early-1960s Mercury versions shown by the OP are still my favorite, powerfully projected, gutsy where warranted yet articulate, and very beautifully recorded; I have these on original Mercury AND the Golden Imports pressings AND on CDr from downloads! I also have one LP from the Fournier set, which provides me with an elegant alternative to Starker when I'm in the mood. I have Casals complete on CD, which I admire but don't really listen to very often. Normally I respond well to Casals' playing, but for some reason I don't feel much involvement in this set. Part of the problem may be the recording. It's not really the age--I'm used to older recordings. But while mine is an early Naxos edition, this is one time when I can't say that their transfers are really preferable to a good earlier vinyl transfer (I used to have the LPs on GPOC library edition, either British or French pressing). It's been a while since I tried Casals, though, so perhaps I should pull it and give another listen. I'm listening as I type to the Starker/Mercury suites 1-3, so that would give me a good basis for comparison. Other versions? Well, I have Harnoncourt on a cheapie MHS set I picked up, but I've only listened through that set once, so I'm not ready to make pronouncements...though I can't say I was overwhelmed, I'm willing to give him another shot. Yo Yo Ma's I checked out from the library, but I wasn't thrilled with his, either. Maybe my taste in the Bach suites has been formed and doesn't want to be altered! I think Heinrich Schiff's stands out as one that takes the notion that this is stylized dance music seriously. His recordings have a rhythmic drive that all other recordings I have heard lack. One of my favorites for precisely the same reason. However, IIRC, Starker did the Bach suites at least three times, maybe more. The EMI are good but the early-1960s Mercury versions shown by the OP are still my favorite, powerfully projected, gutsy where warranted yet articulate, and very beautifully recorded; I have these on original Mercury AND the Golden Imports pressings AND on CDr from downloads! True. However, while technically my copy is an original box, the pressings aren't the earliest, but middle era (lighter "faded" maroon, though not "Vendor" copies), and so wouldn't command top dollar. Actually, even the Golden Import box sets were bringing several hundred bucks a while back, but the high quality vinyl reissue by Speaker's Corner last year has subsequently prevented the kind of feeding frenzy that we once saw. Thanks very much, Que, for your comprehensive review. A more free approach to this music always interests me, so I shall put it on my wish list. Had the chance today to hear the only recordings Du Pre made of Suites Nos. 1 and 2. 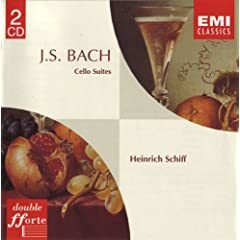 Her reading of the First isn't anything particularly remarkable; for such a (usually) distinctive cellist, she could easily be mistaken for someone else in this recording. The Second Suite, however, is a very different story. It's much more the Du Pre that some people, myself included, know and love. She seems to have invested more time in the study of this work - and indeed, more of herself - and gives it a well-thought performance that makes her version of the First Suite sound like a run-through. When playing of such calibre was once possible, it's a shame she didn't record at least Suites Nos. 5 and 6. Second! Indeed, having several versions of the Cello Suites at this point, I still cannot imagine a recording that I would like and respect more than Fournier's. Hearing him tear into the Prélude from no. 6, for me, is more than enough to cement the deal. He handles the various voices wonderfully and creates the contrasts that Bach, in my mind, created. Thirded! Have Fournier, Slava, Casals, Tortelier and Gendron. Fournier is the most rounded and complete version for me, a very regal account of this masterpiece. Funny, the 'other' Suzuki (Masaaki) isn't that great either when it comes to solo recordings of the music of Bach. Fine conductor though.